Nokia Lumia 620 is a windows based phone and has 3.8 inch screen. So if you aren’t a fan of big phones, you should like it. Powered by 1GHz dual core processor with 512 MB of RAM, it is not the most ideal phone for multi-tasking at a lightning speed but it is pretty efficient. It has a 5 mega pixel primary camera with LED flash. It has an internal memory of 8 GB and 1300mAh battery. It is priced at Rs.15000 but you can buy it at an incredibly low price. Asus Zenfone 2 has a 5.5 inches screen with 1920×1080 pixels giving the phone a 403 ppi pixel density. Backed up by 64 bit Quad core processor and 1.8GHz Intel Atom Z3560 processor and coupled with 2GB RAM, it offers a powerful performance. It is also protected with Corning Gorilla Glass 3 and runs on Android v5.0 Lollipop. It has a 13 mega pixel rear camera and 5 mega pixel front camera. The phone is a dual sim camera and also supports 4G (LTE). It has an internal storage of 16 GB which means more space for your ever increasing files. With 3000 mAh battery, the battery life is also decent. This phone is especially for the photography lovers. It has a 13 mega pixel rear camera and 5 mega pixel front camera. The phone has Sony IMX135 CMOS sensor and has Largen 5P lens, with Schott Blue glass filter. The rear camera has a F2.2 aperture with a rear wide angle of 28mm. This means easy capturing of minute details without any hassles. Apart from this, it comes with a 1.7 GHz Tru-Octacore Mediatek 6592 processor and a Quad Core ARM Mali 450 GPU to let you multi-task easily. Xiaomi Mi 4i has a unibody design and ultra-compact frame with polycarbonate body. It runs on 2nd gen Snapdragon 615 processor which means quick speed and ultra-good performance. It is a 5 inch phone with 1920×1080 resolution which gives 441 ppi density. The rear camera here is of 13 mega pixel and front camera of 5 mega pixel. It has f/2.0 and f/1.8 aperture lens which means high quality images. It runs on Android 5.0 Lollipop and has a 16 GB internal storage. It also has a fast charging technology. So no more frequent charging of your phone. The brand needs no introduction. If you are a Samsung lover, you must check out this particular phone. It is a 5.25 inches phone with 720×1080 pixels display. Again, this one too has a 13 mega pixel rear camera and 5 mega pixel front camera. It has a 16 GB internal memory which is expandable upto a whopping 64 GB. It runs on Snapdragon 410 processor coupled with 1.5GB RAM. With a Li-Ion 2500 mAh battery, it can run smoothly for a day. 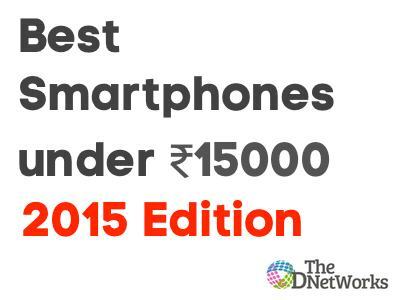 This entry was posted in Android, Featured, iPhone, Mobile, Windows Mobile and tagged 5 Best phones under Rs.15000 for Students - 2015 Edition. Bookmark the permalink. ← Are Mobile Payments Secured?